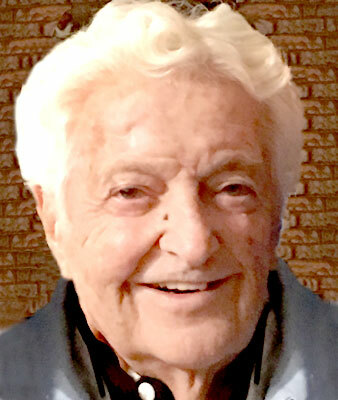 AUSTINTOWN - A Mass of Christian Burial will be held Friday at 11:30 a.m. at the Immaculate Heart of Mary Church for Edward J. Lesho, 95, who passed away Monday morning at Windsor House at Canfield. Ed was born Aug. 27, 1923, in McKees Rocks, Pa., a son of the late John C. and Anna (Bodnar) Lesho. Ed served his country in the U.S. Army in the 29th Infantry in the European Theater in World War II. He was a highly decorated veteran, receiving the Purple Heart, Silver Star, and 4 Bronze Stars. In 1971, Ed retired after 28 years as a warehouse foreman for the U.S. Department of the Army. Ed and his wife, Lillian, were charter members of the Immaculate Heart of Mary Church, where he took on the responsibility of setting up the Christmas nativity set, live-tree arrangements, and served as a summer festival committee member. He was also a member of their senior citizens, parish council and served as an usher at Mass. He held various memberships with Austintown V.F.W. Post No. 4337, Austintown American Legion Post No. 301, Disabled American Vets, Knights of Columbus Msgr. Mears Council, and Boy Scouts of America Troop No. 141 at Immaculate Heart of Mary Church. His wife, the former Lillian O. Dorlosan, whom he married Sept. 24, 1949, passed away Feb. 3, 2001. Ed leaves his two daughters, Rebecca L. Lesho of Canfield and Mary Ellen (Bill) Vaughan of Poland; a son, Edward J. (Carol) Lesho of Canfield; four grandchildren, Shayla (Isaiah) Coomer, Brittany (Jacob) Truax, Taylor Lesho, and Julie (Marc) Paulenich; and five great-grandchildren, Cameron and Ryleigh Truax, Jack, Reagan, and Reid Paulenich. Ed was preceded in death by a sister, Leona Masich and two brothers, Frank and John Lesho. Family and friends may call Friday from 10 to 11:15 a.m. at the church. The Lesho family would like to extend a special thank you to the staff and residents of Windsor House at Canfield for their exceptional care, support and love shown to Ed and his family over the last six months. They would also like to thank Harbor Light Hospice for the professional comfort care provided. In lieu of flowers, material tributes may take the form of donations to the Windsor House in Canfield, Activities Department, 6445 OH-446, Canfield, OH 44406 or Harbor Light Hospice, 4531 Belmont Ave. Unit 9, Youngstown, OH 44505 in Ed’s memory. Professional arrangements are being handled by the Higgins-Reardon Funeral Homes, Austintown Chapel.